Downtown Stockton is a place where everyone can find a little corner that fits their needs or interests. If you’re interested in fitness, healthy treats, or just enjoy a tasty shake, then Stocktown Nutrition might become your new favorite place. Stocktown Nutrition is brand new to downtown Stockton, located at 211 East Weber Avenue, and it is a fun little shop that is a go-to place for those looking to live a healthier lifestyle. As soon as you walk through the door, you’re greeted by smiling faces, uplifting music, and a menu of delicious and refreshing teas and shakes. Tami Tennis, owner of Stocktown Nutrition, explained to us the services that they provide to new customers. “Stocktown Nutrition is a high-energy positive place where we help people be healthy. We offer a service here that is three different products for a total of $8. We give a shot of aloe, that is good for absorption of nutrients, we also do a green tea that has antioxidants and is good for burning fat and speeding up the metabolism. And then our protein smoothies are complete meal replacements.” Those protein smoothies are all less than 250 calories with 24 grams of protein, and come in a variety of flavors from Cake Batter and Caramel Macchiato, to Orange Julius and Raspberry Cheesecake. Another one of the services that Stocktown Nutrition provides to clients is a weight loss program. Stocktown Nutrition has trained coaches that are available for 3-day trials (that start Monday, Wednesday, and Fridays), and a 6-day trial (that starts on Mondays). The weightloss program is a package that includes 6 meal replacement shakes. The program can help with meal-prep or weight loss. 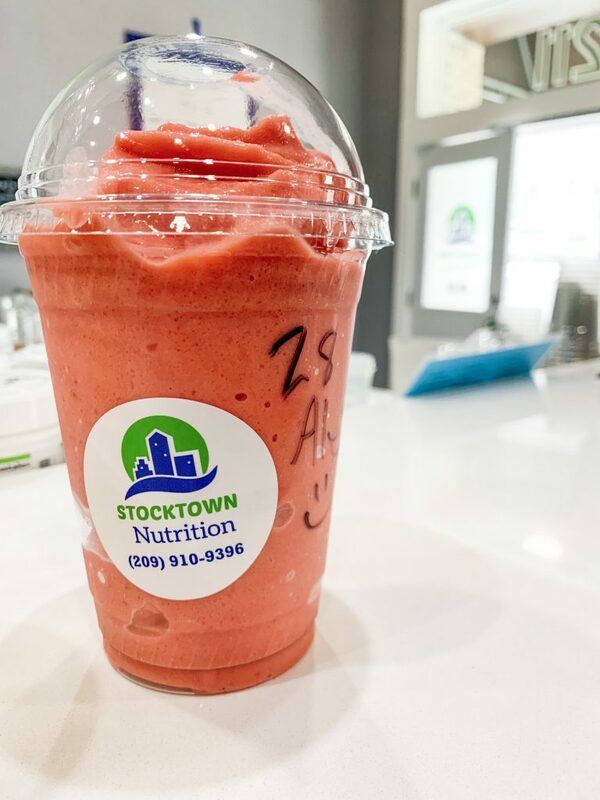 Through a bright outlook on life and flavorful shakes, Stocktown Nutrition is on the path to make people’s lives happier and healthier. As time goes on, Stocktown Nutrition will definitely make downtown Stockton a better place to live and play.